Life in the Smith House: I'm back!!! Got to thinking about the blog and realized I hadn't written in 5 months?!?! I have also been thinking about the direction I want to take this blog and decided its not just for pictures and our Japanese adventure's but also thoughts feelings, daily life, or anything else I want to blabber on about! My goal is to get on here at least once every 2weeks (hoping to do weekly but I forgot how much pregnancy drains you AND how having a toddler makes you even more EXHAUSTED!). Since I feel the need to pick back up and get better about blogging so here we go! These last 5 months have been crazy! After finding out we were expecting (Bristol Nicole, Due June 29th!) and how sick I was in the beginning we didn't get out too much! We have taken trips to the local Zoo but not much more adventuring, or not nearly as much as we would of liked to have been doing. Up until this last month we have stayed home quite a bit especially because Winter got super cold and I was a big baby less than thrilled about the cold! 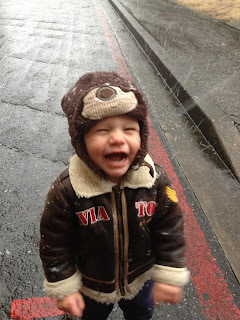 Probably one of my favorite memories of this winter was Sawyer's reaction to seeing snow for the first time! Laughing and trying to catch snowflakes! 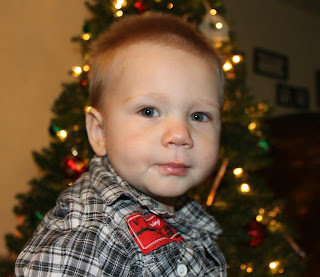 My Little Man is growin' up! Christmas went well, it sucked being away from family but gave us a change to start our own traditions! Time seems to drag but at the same time fly by, guess its always that way during the holiday season! I was happy to see what 2013 will be bringing the Smiths! So far its been a good year and its only going to get better! I think I make a great Centerpiece! Springtime in Japan is BEAUTIFUL and we haven't even got to experience it in full force yet! Now the allergies that come with all the pollen are killer but once you get a good Allergy Cocktail(eye drops, nasal spray and pills) from your doctor you are all set! I have been trying to walk 30min a day lately to help prevent massive pregnancy weight gain. Being 24+ weeks preggo I'm still weighing just as much as my pre-pregnancy weight with Sawyer!!! This morning we went on a walk down to the river to see how well the trees were blooming and to get some good miles in (I want to complete 60miles before May 11th!). Another goal I have is to complete the base loop which is a little over 8 miles, soon but I'm also keeping in mind I don't want to push myself too hard too fast! Pretty Blossoms on this mornings walk! Cherry Trees are just getting going, Can't wait til next week! Now that we are a quarter of the way through 2013 already, I can say I'm please with how this year is turning out so far. Ready for May & June to be here so I can see my Mom and meet Little Miss Bristol!!! Hard to believe in just 6 days we will have lived in Japan 7 months, only about 180 weeks left of living in Japan!